Equitrac is a world leader in intelligent print tracking and cost recovery solutions. 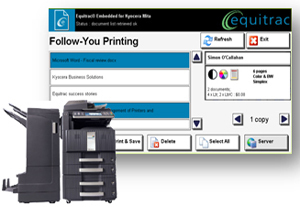 Kyocera offers advanced integration with both Equitrac Office® and Equitrac Express® products. Kyocera’s embedded Equitrac solution is the result of industry leaders working together to streamline your workflow and help you realize your full cost management potential. Seamlessly integrated with Kyocera’s customizable development platform, HyPAS, Kyocera’s embedded Equitrac solution delivers unprecedented convenience, security, productivity and of course, cost savings.